PRODUCT: ACRO 79005 LADDER HOISTING WHEEL WITH HOOK. PRICE/EACH. Lightweight 12" aluminum wheel with dual-roller bearings and a grease fitting in a sturdy all-steel frame. Conveniently converts your ladder into a hoist. Lifts up to 300 pounds of supplies to your roof. Heavy-duty forged swivel hook has a safety latch for added security. 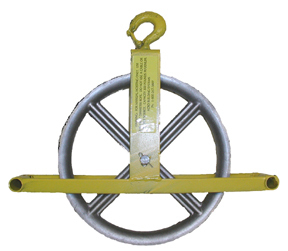 ACRO 79000, EXTRA-LONG LADDER HOISTING WHEEL (DERRICK), EXTENDED 24 inch HANDLE. PRICE/EACH.